On the 24th day of March 1876, T. B. Roberts of Tippah County, Mississippi, executed a deed in favor of Thomas B. Tigert. But what followed the legalese wasn’t the usual kind of property description you find in a deed. It is, the cover of this old record book says, a chattel deed. And they’re wonderful records whenever they can be found. So how did a chattel deed work? It was fundamentally a secured loan: an IOU with teeth. It contained specific terms that gave the person lending the money the absolute legal right to take possession of and sell the security — the horse or the crop in the ground — if the loan wasn’t paid back.5 And it was a common tool for farmers and sharecroppers to get the supplies or cash they needed to get through until their crops came in. These deeds provide good information about, for example, the types of crops being grown in a particular area. 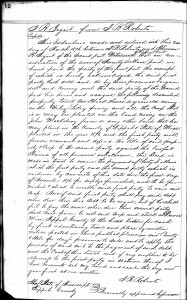 The Tippah County chattel deeds speak of cotton and corn. They also give some measure of the expected value of a particular farmer’s crop: some could borrow hundreds of dollars; others, like Roberts, needed more than just his crop as security for a mere $60 in supplies. And they identify the wealthier members of the community — those in a position to make the loans. In a good year, the farmer or sharecropper would redeem his crop or livestock or other property posted as security well before the deed would become effective to transfer title to the lender. Some chattel mortgages have marginal notes that they were paid, and when. I can’t understand how people with money to burn would allow their neighbor to lose his farm over failure to repay a debt of $60. Heartless. Ah, but we’re engaging in assumptions if we conclude that anyone involved had “money to burn,” Shirley. We need more facts before reaching any conclusions at all, other than that these are great records to add to our arsenals. When I saw “chattel” in the title, I thought you were going to talk about slaves. I guess they would be “chattels personal.” I believe they were used to secure loans, also. Alas. Alas, you are quite right: slaves were personal property, so chattels personal, and they absolutely were used as security on loans. 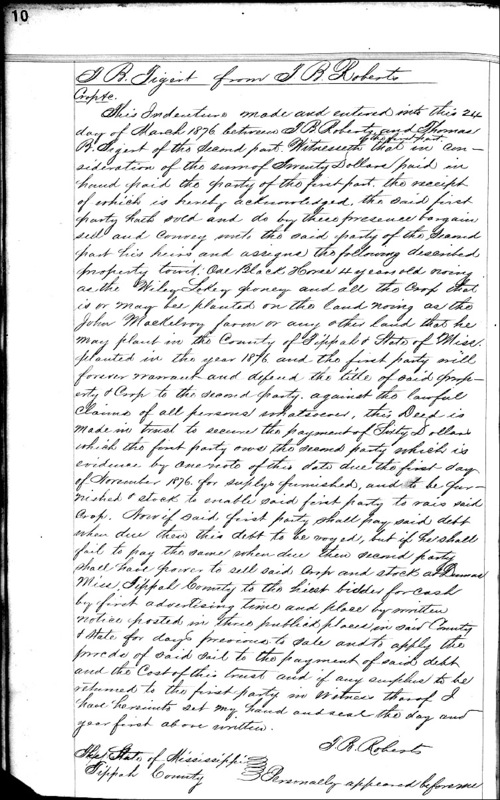 I was shocked to find just such a document in my own family history — a slave used as security for a business loan in 1830s Lowndes County MS. I wrote quite an extensive article regarding Affirmative Action and the Clarence Thomas Factor and in it I quoted, or alluded to something I heard was a part of Black Law Dictionary pertaining to chattle personal, that is still on the book and very legal. I did not have the Edition nor the page number are you familiar with that citation or law there? I would very much like to know that information – thanks! Black’s Law Dictionary, 2d edition (1910), is online at Google Books. You’ll find a reference to chattels personal in the second paragraph of the definition of chattel on page 194.